The Church of the Savior on Spilled Blood was built on the site where Emperor Alexander II was fatally wounded in March 1881.The church was built between 1883 and 1907. The construction was funded by the imperial family. 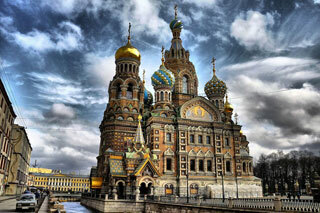 Architecturally, the Cathedral differs from St. Petersburg's other structures. The city's architecture is predominantly Baroque and Neoclassical, but the Savior on Blood harks back to medieval Russian architecture in the spirit of romantic nationalism. This article uses material from the Wikipedia article "Church of the Savior on Blood", which is released under the Creative Commons Attribution-Share-Alike 3.0 License.